The world’s most successful triathlon coaching team. Online coaching and training plans for age-group athletes of all abilities. Use the training methods that have guided athletes to World, Olympic and Ironman championships. Flexible coaching packages designed to accommodate your lifestyle needs and focus on developing your fitness, endurance and race-day performance. We want to a be a part of your goals, your training, your success. 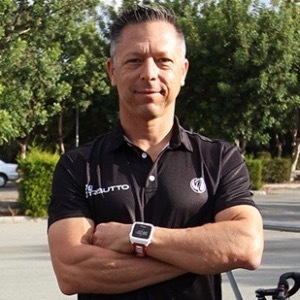 Over 28 years of triathlon and multisport experience. Competed in races of all distances including the Ironman World Championships in Hawaii. Successfully coached numerous age group athletes to personal bests, AG podium finishes, 70.3/IM WC qualifications and Boston Marathon qualifications. Ability to motivate people stems from 25 years as an officer in the Canadian Armed Forces having served in various challenging positions at home and overseas. Avid skier (xc and alpine) and biathlete. Former provincial Champion/National Silver medalist in 4-way formation skydiving. Fluent in four languages (EN, FR, HU, IT). Tri Can trained, studied at National Coaching Institute – Calgary, BA. Royal Military College, Kingston. “Success” is defined more by the hard work, patience, perseverance and commitment to acquire it than the actual performance that marks it. Highly determined, mature, positive and open mind-set, self-spurred drive to be the best they can be. Min HRM/GPS for beginners, + PM for intermediate and above experience. Success. Coach Ed Rechnitzer has been notified of your message.